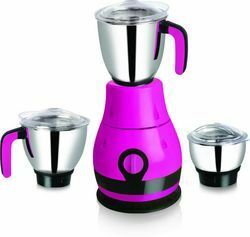 Providing you the best range of 3 jar mixer grinder, electric 3 jar mixer grinder, automatic 3 jar mixer grinder and economical 3 jar mixer grinder with effective & timely delivery. Highly efficient in working, offered 3 JarMixer Grinder is reliable in working and easy to use. Offered grinders are light in weight and quickly get installed. Showing longer life working, offered grinders are optimal in finishing. Besides this, these grinders are compact in size and easy to shift. We are engaged in offering a wide array of Electric 3 Jar Mixer Grinder. 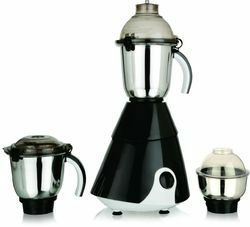 These are provided with two separate blades for grinding and blending, the grinder easily handles whole fruits and vegetables, spices, nuts, and coffee beans. Offered array of product is highly demanded in the market. Moreover, we assure to our valued clients to provide a quality tested range that can be delivered from our end at a leading market price. Add Flour into Bowl. Insert Kneading Blade. Close the Lead. Run for few Seconds. We are actively engaged in offering high quality assortment of Automatic 3 Jar Mixer Grinder. Our products are extensively demanded by various food & beverage industries. These products are made using superior quality raw material and latest methods of production. Along with that, these products are manufactured under the guidance of highly skilled quality experts and easily available at market leading prices. Backed by a rich industrial experience, we are engaged in bringing forth a comprehensive variety of Economical 3 Jar Mixer Grinder.